Select information sources that present multiple perspectives on your research topic. Perform keyword searches appropriate to your topic. Students are able to assign proper attribution and citations using APA Citation Style. The following learning resources and exercises will guide you through a research process and help you to explore a variety of information sources. This research process can be used to identify information sources for a variety of speech types. For best results, use your current speech assignment as the topic for each of the recommended learning exercises. Your instructor may assign a specific forum in which to share your work from each activity (in-class activities and discussions, D2L discussion posts, or D2L Dropbox reflections.) All of the resources you see in this chapter can be found on the UWM Libraries guide to research for Communication 103 (http://guides.library.uwm.edu/comm103). When you are researching your speech topic, you should start by planning your search strategy to allow you to define the scope of your search. In other words, defining the scope of your search will help you to determine which aspects of a topic you will research. The first step is to break a larger topic down into smaller manageable “chunks,” or topics. Once you know what the “chunks” of the speech are, you will need to identify the concepts that should be included in your search. LEARNING ACTIVITY: Watch the Communication 103 Search Strategies video series (all four) for Exercise 1: Search Logic, Research Topic, Finding Key Words, and Initial Search (https://www.youtube.com/watch?v=nvaz5Hib3cM). Then, make a list of everything you already know about this topic. List one thing about this topic you are unsure of and one aspect that interests you. LEARNING ACTIVITY: You will want to organize your search using a mind map. A mind map is a type of graphic organizer that will allow you to visualize the elements of your topic. Use the Mind Map to help you structure your online search. Download a blank mind map (http://guides.library.uwm.edu/ld.php?content_id=35133367) and develop a graphic organizer for your own speech topic. Work with a partner to discuss the concepts you have identified and ask for feedback and suggestions to help you explore the topic. Another strategy for organizing your search for information is to consult sources of background information that will help you establish facts, theories, vocabulary and other elements of your topic. CQ Researcher provides authoritative in-depth, unbiased reports of health, social trends, criminal justice, international affairs, education, the environment, technology, and the economy. Search CQ Researcher (http://guides.library.uwm.edu/c.php?g=56384&p=5097593#s-lg-box-wrapper-18904894) for some of the concepts in your research topic. For example, medical marijuana, opioid addiction, refugee crisis, online privacy, or domestic drones. Find a report that addresses your topic. Write a brief summary of the issues discussed in this report. Select a report in CQ Researcher that discusses your topic or issues related to your topic. Choose a source from the report’s Bibliography section. Find this source by following the links provided in the bibliography or use Search@UW (http://uwm.edu/libraries/) to find the source at UWM. Write a brief reflection on this new source. What new perspective is presented in the source you selected from the bibliography? How might this source help you present this topic or issue to your audience? Now that you have organized your search and reviewed some background information in CQ Researcher, you will want to think about additional information sources that will help you develop your speech topic. Whether your goal is to educate your audience, support an argument, persuade or propose a solution to a problem, you will want to identify sources that lend credibility to your presentation. You will also want to make sure that you research the whole topic, not just one part or one perspective. When you develop your search strategy think about what you want to know about the topic. If you are educating your audience about opioid addiction, will you address the costs of opioid addiction to the community? Your search terms might be the opioid addiction and public cost. Jot down the aspects of your topic you would like to address for your audience. Create two to three sets of search terms to express these specific aspects of your search. View the Neutral Sources video (https://www.youtube.com/watch?v=Ye3a0sEhpw8). Reflecting on the strategies described in the video for selecting a source that discusses multiple aspects of a topic, then use Search@UW (https://uwm.edu/libraries/) to search for your speech topic. Identify a source that will help you persuade or inform, and also includes a robust discussion of your topic. Write a brief summary of the way you will use this source. Citing sources in your speeches and your speech outline is necessary to avoid plagiarism and build your credibility. Citation in speeches is a little different than citing sources in a written paper. In a written paper, your in-text citations, or citations within the body of your paper, follow a specific format, like APA or MLA. However, in your speeches, while your bibliographies will follow a format, like APA, your verbal citations will be in verbal citation format. Verbal citations are oral statements that give the audience information about the source you used for a specific piece of information in your speech. Based off of the name, you can deduce that the citation is spoken out loud, verbally, to build your credibility and inform your audience about where you received the information. Additionally, if there is a source in your bibliography, you should verbally attribute the source in the speech. And vice versa, if you verbally cite a source in your speech, you should include the source in your bibliography. At this point, you are probably wondering, what should be included in my verbal citations, and how exactly do I verbally cite my sources. First, in each of your verbal citations, you should include: the author’s name, the source (journal, book, website, newspaper, etc. ), the date of publication, and the credentials of the author or the source. In some instances, you may not be able to find all of this information for your source. These instances are one of the reasons you should always be working ahead in your speech. If you can’t find all of the information, you should consult a librarian or ask your instructor to help you. The citation tells you the author (Katie Hall), the source (the Pathfinder website), the date (January 4, 2018), the credentials of the author (Pathfinder’s Vice President of Housing), and the credentials of the organization (an organization that provides housing resources to over 220 Milwaukee youth annually). According to an article by reporter John Schmid in the Milwaukee Journal Sentinel, Milwaukee’s local paper, on March 23, 2017, explained that Milwaukee is in a public health and economic crisis. This citation tells you the author (John Schmid), the source (Milwaukee Journal Sentinel), the date (March 23, 2017), the author’s credibility (reporter), and the source’s credibility (Milwaukee’s local paper). These citations may seem long and perhaps hard to say. However, as a speaker, you should consider your audience’s perspective. If you give them all of this information, they will view you and your source as credible to provide information. To help yourself out when delivering your speech, you may want to write out your sources word-for-word, and practice saying them, so that your delivery seems more natural. A verbal citation is an oral statement that gives the audience information about the source you are using for a specific piece of information in your speech. Citations give credit to those whose ideas have contributed to your research and give your readers enough information to locate the sources you used. There are many ways to format citations. The style you choose depends on your field and the requirements set by your professor or publisher. In these examples, we will use APA Style. The template shows the elements of the citation required for proper APA style, the order in which each element appears in the citation, and the punctuation you will use to define each element. The examples show how typical books and article would be cited following this pattern. Select a book or an article from your database searches. Looking carefully at the citation as it is listed in the database, list all the parts of the citation. For additional support identifying the parts of a citation from a journal article, database record, and other sources, see Finding Key Citation Information (http://guides.library.uwm.edu/c.php?g=56454&p=363100#s-lg-box-wrapper-11065838). After identifying the elements of the citation for at least three of your sources, use the Template for Books or the Template for Articles to write an APA style citation. Check your list of elements to ensure you were able to place each element in the citation correctly. Share your formatted citations with a partner in class or via the discussion board. Ask for feedback on the formatting. 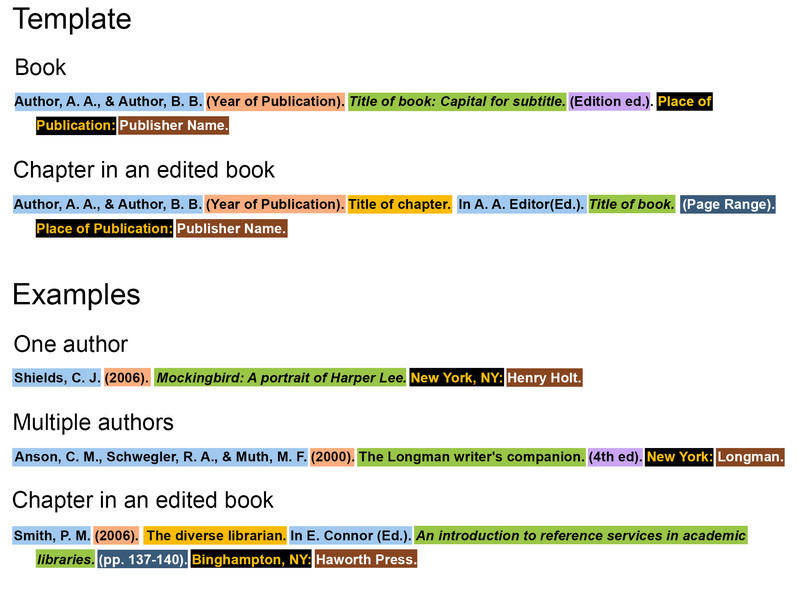 Additional examples of APA Style Citations can be found using the APA Publication Manual available from the UWM Libraries (http://guides.library.uwm.edu/c.php?g=56384&p=5097784#s-lg-box-wrapper-18905232) or online guides like the OWL at Purdue (https://owl.purdue.edu/owl/purdue_owl.html).